We have worked hard to raise awareness of the symptoms of cardiac arrest, and we provide basic life-support training courses. As a result, the number of people surviving cardiac arrest has risen significantly over the past few years, but more can still be done. Learn to recognise the symptoms of a heart attack or cardiac arrest and the action you can take, and you may be able to save someone’s life. ‘Shockingly easy’, features Paramedic Karen Walling showing what to do if you see someone suffer a cardiac arrest, including how to shock their heart to get it started again. Have you ever thought about learning how to save someone’s life? Would you know what to do if someone suffered a cardiac arrest, heart attack or was choking? We offer Heartstart training free of charge to voluntary/community groups and charities. 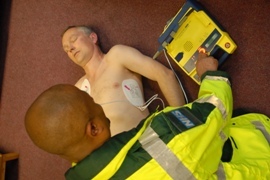 We also provide emergency life-support training to organisations in the public and private sector at a cost. In this short video, we explain how we’ve improved heart attack care for patients in London. Lee was at home jamming with friends last July when he suffered a cardiac arrest.